Good morning everyone. I hope that you and your loved ones had a fantastic Thanksgiving Day weekend. 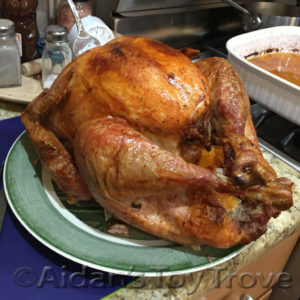 We went to the in law’s house for Thanksgiving day dinner and it was scrumptious! Aidan had a grand time. I told him not to eat too many sweets which in his mind amounted to 3 big cookies before dinner and 2 pieces of pumpkin pie after. He was pinging off the walls after dinner, that’s for sure! On our drive up to Thanksgiving Dinner, we saw a beautiful waterfall cascading down the mountain. I suppose the one good thing about the constant rain is that it makes pretty waterfalls, LOL. 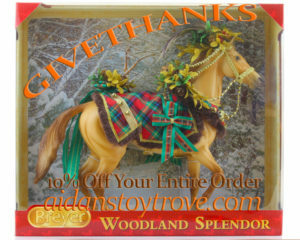 On a model horse related note, I wanted to remind everyone that today, Sunday November 27th is the last day to take advantage of our Thanksgiving Day Sales. I’m positively thrilled by the number of sales that the website processed. Hubby and I have spent countless hours working on the website to get it to the point that it is at. Making the shipping cost accurate was the hardest part. We use WordPress and free plugins for our website. And surprise, most of the GOOD plugins cost money. I was ready to just pay the money for a shipping plugin and almost like magic, everything just came together 🙂 Do any of you run your own website shop? And if so, what platform do you use? 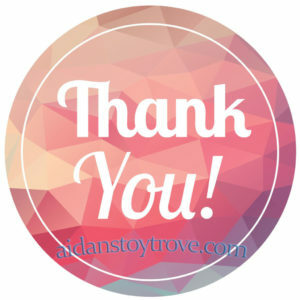 Thank you everyone for your interest and support of Aidan’s Toy Trove. We are truly humbled by the sheer number of wonderful hobbyists that we have had the pleasure to ‘meet’. We couldn’t be what we are today without you! Thank you!